This program supports research and production of new animated work by artists through a combination of funding and in-kind resources. After the success of the last four years of TAIS’ artists in residence program, the boundaries continue to expand for the types of works year five aims to support. The fifth year of the program is seeking ONE (1) Canadian artist and ONE (1) International artist to each engage in self-directed work, towards the completion of a new independent animated film or video. This residency comes with a combination of monetary funding and in-kind use of studio space, equipment and resources at TAIS Studios, located at 1411 Dufferin Street, in downtown Toronto. Founded in 1984, the Toronto Animated Image Society (TAIS) is an organization dedicated to exploring and promoting the art of animation through production, screenings, workshops and exhibitions. 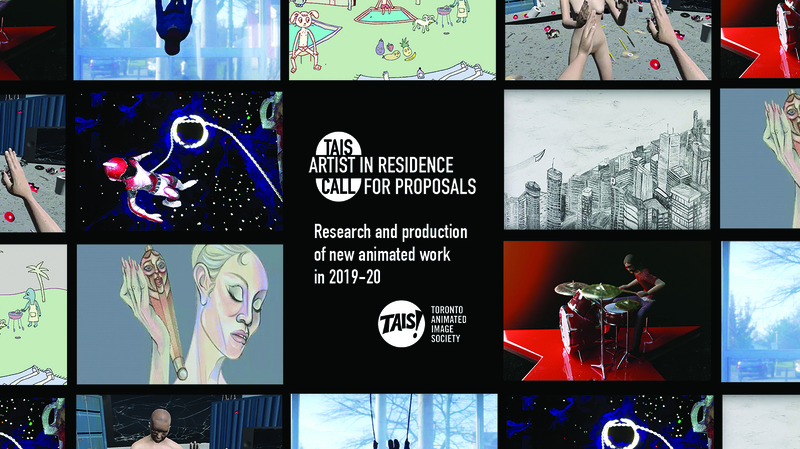 As an artist-run production centre, TAIS provides affordable access to space and equipment; offering services to independent artists who make animated films within contemporary art practices. The Canadian Artist Residency is three-months long, taking place over consecutive months between May 2019 and March 2020. The goal for this Canadian Artist Residency is to emerge with a finished work. The selected Canadian artist will be awarded with $9,000, comprised of $3,000 in-kind towards 3-months of studio space, equipment and resources at TAIS Studios, and $6,000 in cash funding for the project. The International Artist Residency is one-month long, and will take place over consecutive weeks between May 2019 and March 2020. The goal for this International Artist Residency is to experiment with the resources available at TAIS to advance or complete a work. The selected International artist will be awarded with $3,500, comprised of $1,500 in-kind towards studio space, equipment and resources at TAIS Studios, and $2,000 in cash funding for the project. Applicants must be TAIS members (of any level) to be eligible; non-members wishing to apply may register for membership on our website HERE. Member fees: $20/year Supporting Membership, $50/year Studio Membership. For this Residency program, it is imperative that the selected artist(s) plan to interact and experiment with TAIS equipment and resources. Proposals that are strictly research or pre-production without any actual production component are not eligible. TAIS will retain a copy of the final work for archiving, dissemination, and presentation. Limited travel, accommodations, and materials coverage may be available through this program. The selected artist is able to contribute additional funding from other sources. TAIS will provide letters of support as needed, toward additional funding for the artist. Projects servicing a third-party producer are not eligible; the work must remain in the artistic control of the artist. Proposals that are strictly research or pre-production without any actual production component are not eligible. Only production and experimentation that takes place at TAIS Studios is eligible for support as part of this program (access to the studios will be available 24 hours a day, 7 days a week, throughout the residency period). In order to be eligible, the selected artist(s) must sign a contract with TAIS and must agree to report on their project expenses and progress. *CLICK HERE to download an Application form and Budget template. TAIS recommends using the checklist and template when writing your proposal and creating your budget. Online links (vimeo, dropbox etc.) of TWO (2) samples of recent work. Describe how this work relates to your project. (Please do not remove these samples until after our notification date or you risk the jury not being able to see them). Living expenses (Rent, meals, local transportation) – Please note that, while living expenses are eligible, accommodations and travel outside/to Toronto are not eligible. Additional equipment rental (if not available at TAIS Studio). Equipment listing available here. The selected artist(s) will sign a contract with TAIS before offer is confirmed. The selected artist(s) proposals, bio, and other support materials will be included in TAIS fundraising applications, and included as part of the condition of acceptance of the offer. The selected artist(s) will receive their cash funds in instalments. The first payment (50% of total fee) will be released at the beginning of the residency period, and subsequent payments (two payments of 25% of total fee each) will be released upon delivery of interim and final reports. The artist is responsible for ensuring reports are delivered on time in order to receive funds. The agreed upon schedule of work/reporting must be followed for fees to be released. Upon the project’s completion, TAIS will take on an active role in promoting the finished film on the festival circuit, in markets and artist-run centres as a film produced at TAIS Studio, and will have non-exclusive rights to arrange exhibitions of the film, in consultation with the artist. Any marketing or promotional expenses related to these exhibitions will be the responsibility of TAIS, but an administrative fee of 10% may be deducted to go towards these costs before any earned artist fees are dispersed to the artist(s). The 2019 Artist in Residence Program is presented with the support of the Canada Council for the Arts, the Ontario Arts Council, and the Toronto Arts Council.